Anna Matnadze: Are you happy with your result at the Magistral Casino Barcelona? Antoaneta Stefanova: Yes, I am happy. I tried to play well in every game. The tournament was very strong, and I’ve played well. I just lost in the final round, but Dreev is a special player, plus I was black, you can lose. I can not complain. Anna Matnadze: What is your preparation? How many hours a day to spend with chess? Antoaneta Stefanova: I am not very disciplined. Some people might comment that this is bad, but … I can work eight hours or more when inspired, but there are days that I don’t even touch the chess set. I enjoy reading chess books, take my time to understand them well. Sometimes it is being said that this is the time of Fritz, of Rybka, and so on. But I like to immerse myself in reading, thinking, understanding. Anna Matnadze: What to think of the fact that machines are becoming stronger? Antoaneta Stefanova: The programs do not intrigue me. Today, there is so much information and analysis that almost an entire game can be a line brought from home. I would prefer to improvise on the board, which makes a chess match more human. Anna Matnadze: Which format do you think is best suited for the world championship? Antoaneta Stefanova: I won in knockout format, therefore I can not complain (laughs). True, there is a lot of tension, but this happens irrespective of the format. When there is a goal, there is tension as well. For example, I like the new idea of the FIDE Grand Prix on Women. As I understand it, the winner of the Grand Prix will play the winner of the knockout, and then leave the World Champion. Anna Matnadze: What time control do you prefer? Antoaneta Stefanova: The shorter, the better – but with increment. I like to play with a second time control. Anna Matnadze: Still, chess is not represented in the mainstream media, like, for example, football or tennis. What could be done about it? Anna Matnadze: Your country has fantastic achievements in chess, those of Topalov, Georgiev, yourself … What should be done in a country to grow players of that caliber? Tell us something about chess in Bulgaria. How does it work? It is a compulsory subject in schools? Antoaneta Stefanova: It’s tradition. Not all schools have chess classes, but some do. For example, my nephew is in a private school and they have chess. There are also clubs, but mainly, there are specialised chess schools. If a father wants his son to play chess, they go to one of these schools. There are many Grandmasters giving classes. Interview courtesy of IM Anna Matnadze and Magistral Casino de Barcelona website. 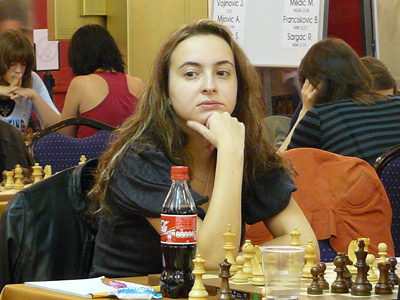 GM Stefanova is currently playing at the Chess Olympiad in Dresden, bellow is her 3rd round game.